Children learn naturally when playing. Creative play gives them the possibility and security to explore various learning activities. This elementary lesson plan for an Eric Carle book supplies literacy learning in a play environment teaching about ladybugs. It opens up the world of print to growing minds, and teaches the significance of literacy. Exposing children to the written word accustoms them with the way language is written. Hold the book up so the children can see the cover. Point to the book title and pronounce it, then point and say the name of the author. Teachers ask the class to predict what will happen in the story based on the cover illustrations. What happened when the two ladybugs landed on the same leaf? Why did the grouchy ladybug fly away? Why does the ladybug want to fight? What does the ladybug say to the animals? What did the ladybug do when the whale would not answer her? Where did she fly next? What happened when the ladybug reached the whale’s fin? What did the whale do with his tail? Where do we find the ladybug at the end of the story? There are many animals pictured in this story like a sparrow, hyena, gorilla, and others. Whenever you come to an illustration of one of the animals, stop and say something like this: “I hear a gorilla. It sounds like this (make the appropriate sound)." Point to the picture, and ask the children to imitate the sound. Encourage the children to touch their ears again to reinforce the sound-word link. This engages the visual and auditory senses, and helps the children associate words, pictures, and sounds. If an animal does not make a sound, ask the class a question like, “What sound do you think a praying mantis might make?" For the next part of the lesson, turn back to the pages showing the clock pictures, and follow the time sequence of events with the children. Help students make the link between the passing time and the ladybug’s lack of success in getting food. Compare and contrast each animal's size with the ladybug's. Why does the ladybug tell each animal that they are not big enough? 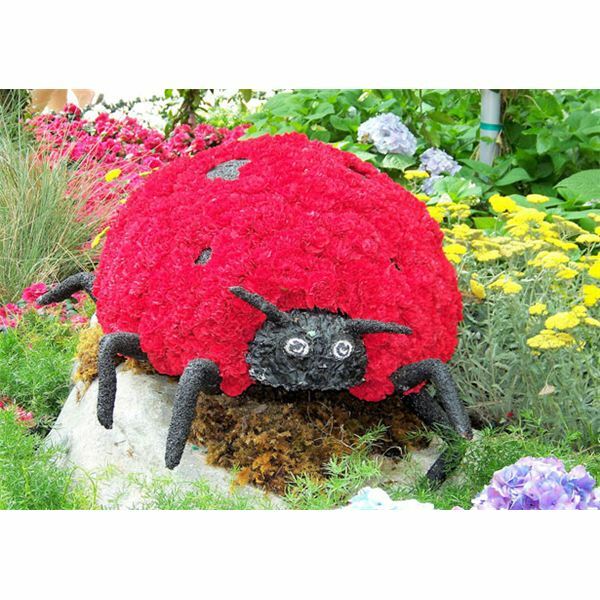 Finish this elementary lesson plan for The Grouchy Ladybug with gross motor skills practice. Call out the name of one of the animals from the story, like the gorilla, and invite children to move like a gorilla. Model big arm movements and chest pounding. Continue calling out animal names and modeling movement until the children get tired. This is a good large muscles exercise, and the various motions and gestures help the children to expend pent-up energy. By the end of this lesson plan, the children have followed oral directions, practiced pre-reading skills, and learned about politeness and manners. Literacy has been reinforced by using visual and auditory cues to make a bridge between pictures and words. "What sound does this animal make?" "What letter of the alphabet does the animal's name start with?" "What sound does the letter make?" Here is a series of articles providing an elementary lesson plan unit on The Grouchy Lady Bug by Eric Carle. This unit includes a lesson plan, vocabulary exercises, and other skills-based activities.